There are companies and individuals who proclaim, "you can change your accent entirely in 8 weeks" and "book now for our life changing accent eliminating workshop!" Sounds too good to be true, doesn’t it? Can you eliminate your native accent? Can you improve your pronunciation? Can you sound clearer? Let’s dive in to what we know from research and extensive experience. As speech-language pathologists who have been helping adults with accent related concerns since 2012, we know what others are promising. ✗ Accent elimination - be alarmed. There is no such thing as accent elimination. ✗ Accent reduction - be wary. It is technically inaccurate to say we are reducing an accent because we all have accents. There is no person with a null accent in this world. 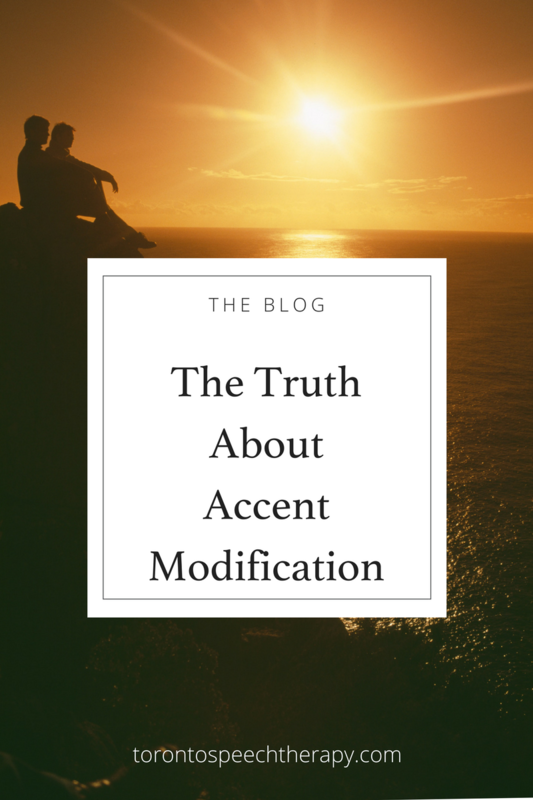 ✓ Accent modification, adjustment, or softening - be curious. We can change our accents through work on improving pronunciation, stress, rhythm, and intonation. Furthermore, pronunciation training - the primary mechanism of accent services - takes time. Even with the most experienced clinician, you can expect to spend many weeks and months mastering vowels and consonants that you are not pronouncing correctly. We know that actors change their accents for roles all the time, so is it possible? Actors change their accents, yes, but the difference between an actor and a regular speaker is that an actor is working from a script. He or she is memorizing lines for a role which is much easier than speaking in an unplanned way. Secondly, this is the actor's full time pursuit. Most professionals who are improving their accent will budget one to two hours per week on it as they also have other responsibilities, like a day job. As a result, comparing your accent adjustment to that of an actor is not entirely realistic. Can you improve your pronunciation and as a result, your accent? The answer is a resounding yes. An accent is comprised of your pronunciation, your consonant system, vowel system, stress, rhythm, and intonation. Many people have heavier or more pronounced accents because they didn’t have high-quality pronunciation training while they were learning English. With improved pronunciation, you will sound more similar to the way native English speakers speak. The purpose of this article is to help you to establish realistic expectations. Will you sound perfectly “Torontonian” in all conversations and contexts? Probably not. Will you sound clearer and easier to understand? Yes. Will you feel more confident when you are speaking? Absolutely. Your reasons for improving your pronunciation (or accent) are entirely your own. A speech-language pathologist (AKA accent coach) can help you to become more confident while speaking English by helping you improve your English pronunciation. If you are motivated to change your pronunciation or accent, it’s important to choose an experienced and knowledgeable speech-language pathologist who will work with you to set and achieve attainable goals. With attainable expectations about your accent, the dedication to work toward your goals for many weeks - potentially months - and with daily practice, you will notice positive improvements. This means you will be asked less frequently to repeat yourself and you will begin to like how you sound more. While it’s cliché, practice does make perfect when it comes to your clear and confident speech. If you would like to know more about accent modification, please feel free to contact us at the clinic. We are here to help. Interested in accent modification services?